Courses: Leading for Understanding, Teaching for Understanding, Dimensions of Understanding, Differentiated Instruction, Algebraic Thinking. I also serve, and have for the past 10 years, as a “full summer faculty” member at Project Zero, a branch of the Graduate School of Education. My role there is to teach educators how to build curriculum from what they are learning. 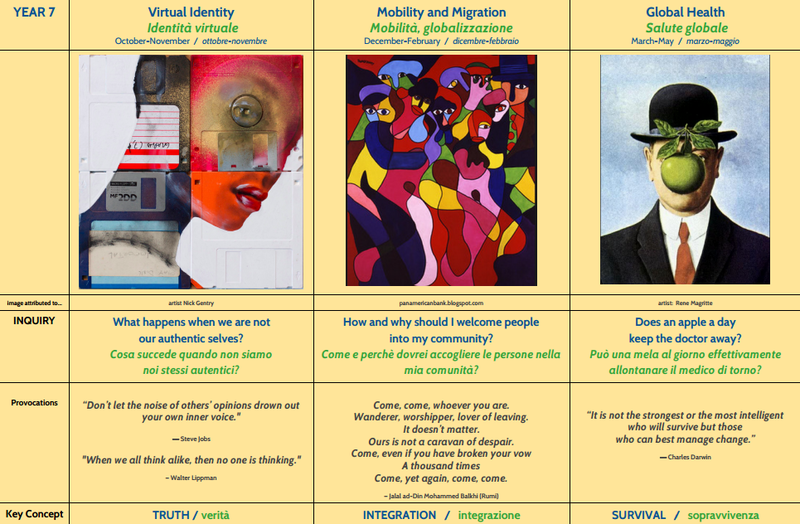 Participants engage in a variety of philosophy of learning and content-oriented courses and then, each day, bring their understandings and questions to my course for shaping these into classroom and cross-curriculum units of work (see below for details). I am proficient in communicating with both English and Italian speaking faculty and parents in both languages. My language skills bring value to the school for understanding our local culture, particularly parents’ perspectives about learning. 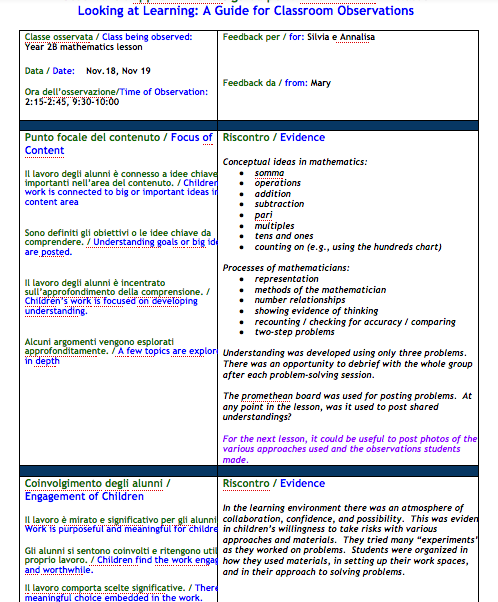 I regularly work with the Italian Ministry of Education documents, giving me insight into the Terza Media structure. Teach and apply principles of Teaching for Understanding and Understanding by Design in developing concept based curriculum in collaboration with teachers. 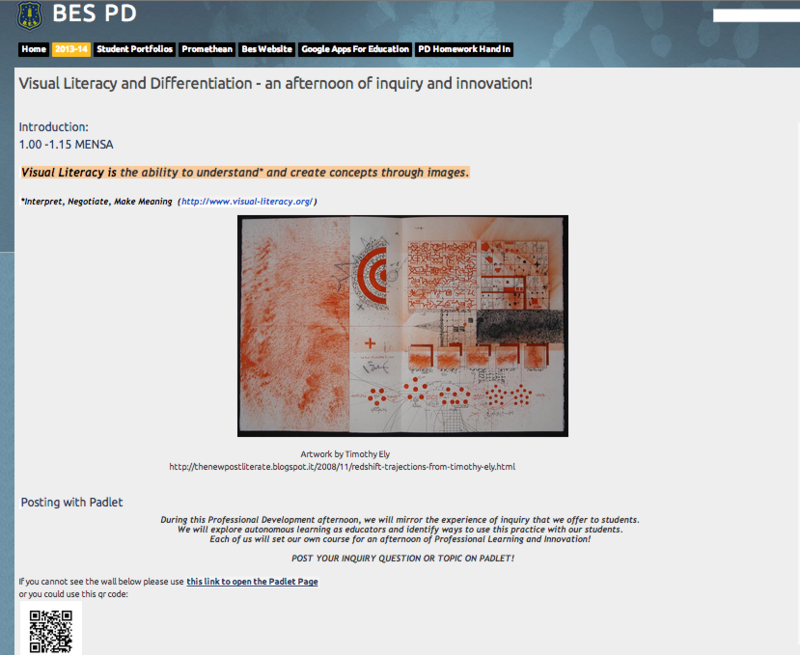 Develop and refine the Primary School Transdisciplinary Program of Inquiry. Develop and refine the Middle School Interdisciplinary Program of Inquiry, focused on global issues. Facilitate the collaborative development of disciplinary units of study. Facilitate weekly meetings for team planning, assessment, teaching and learning strategies, documentation, and reflection. Observe classroom learning, model and co-teach lessons with teachers, and participate in student learning experiences. 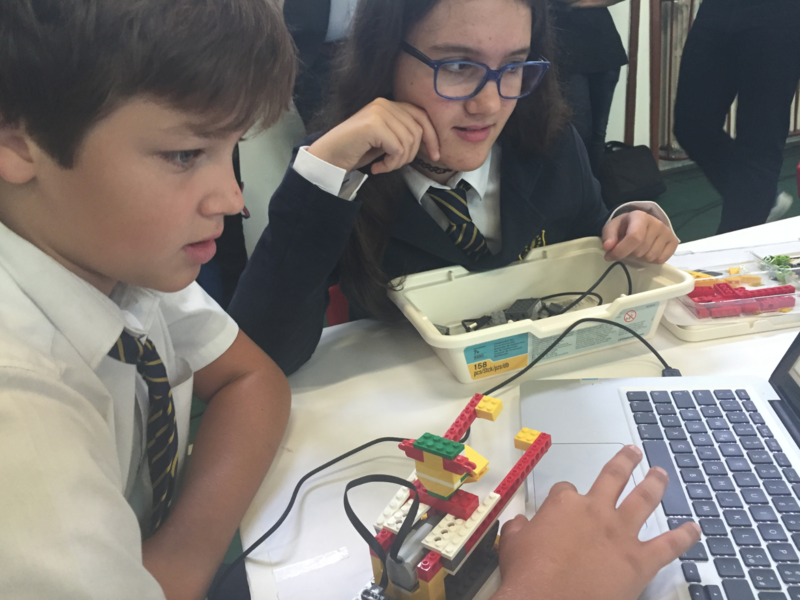 Provide teacher support and modeling in a LEGO maker-space and develop related curriculum. Guide reflection on and refinement of curriculum mapping in June and September of each school year, analyzing the program for vertical and horizontal articulation. 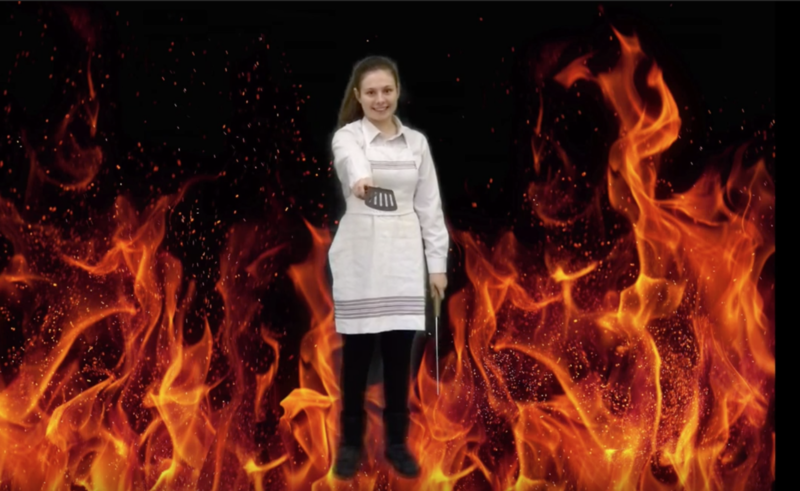 Align, monitor, and evaluate the development of disciplinary skills of research, thinking, communication, self-management, and social skills across the school. Develop school-wide and classroom assessments, participate with teachers in analyzing assessment data, evaluating student learning, identifying areas of strength and learning challenges, and developing curricula and teaching practices to address learning goals. Organize and monitor school-wide assessments for writing, reading, and mathematics. Organize and monitor administration of the International Schools Assessment (ISA) for years three through eight. Organize and monitor online International Schools Assessment for science with middle school students. Participate in the Educational Leadership Team. Organize leadership team tasks, identify areas of focus and follow through for the school's Strategic Plans for primary and middle school, provide teacher support for actions, develop creative approaches to program development. Lead the school’s Self Study process and successful evaluation as an International Baccalaureate World School in 2013, and currently preparing for the May 2018 Evaluation Visit. Prepare an extensive Google Site with documentation of the school's development according to the IBO standards. Co-facilitate a teacher induction program with regular sessions on various aspects of teaching and learning. The Association provides support for IB World Schools in Italy through various means such as sharing effective teaching and learning practices and providing professional development opportunities. I have participated with the organization since September 2013 and am a member of the Board as the PYP Representative. 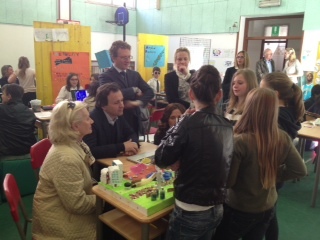 As facilitator of the coordinators' study group, I develop professional learning opportunities among the schools, including two IBO Cluster Workshops for teachers in Italy and numerous school visits. 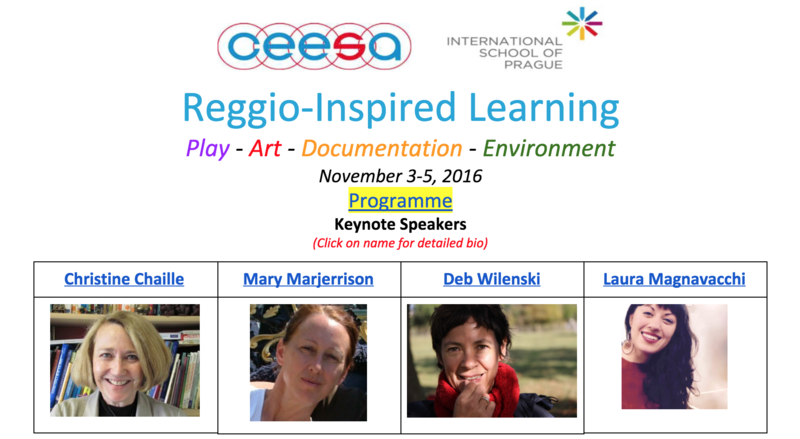 I lead the development of Approaches to Learning continua for IB-PYP and MYP teachers. Coach an online course, Making Learning Visible, on group learning and documentation strategies for improving teaching and learning. Facilitate teacher teams' application of course content in their own settings. Monitor and give feedback to participants who come from a wide range of global education settings and experiences. Collaborate with other coaches and course developers to analyze and improve the course. Guide participants' synthesis of learning and development of curriculum at the institute. Lead mini-workshops in response to participant needs and overall institute goals, including documentation and reflection strategies. Counsel participants through action plans that they take back to their schools. Develop and facilitate a course on professional reflection. Facilitate participants' interaction with course content. Monitor and encourage participants, and guide problem-solving when difficulties arise. 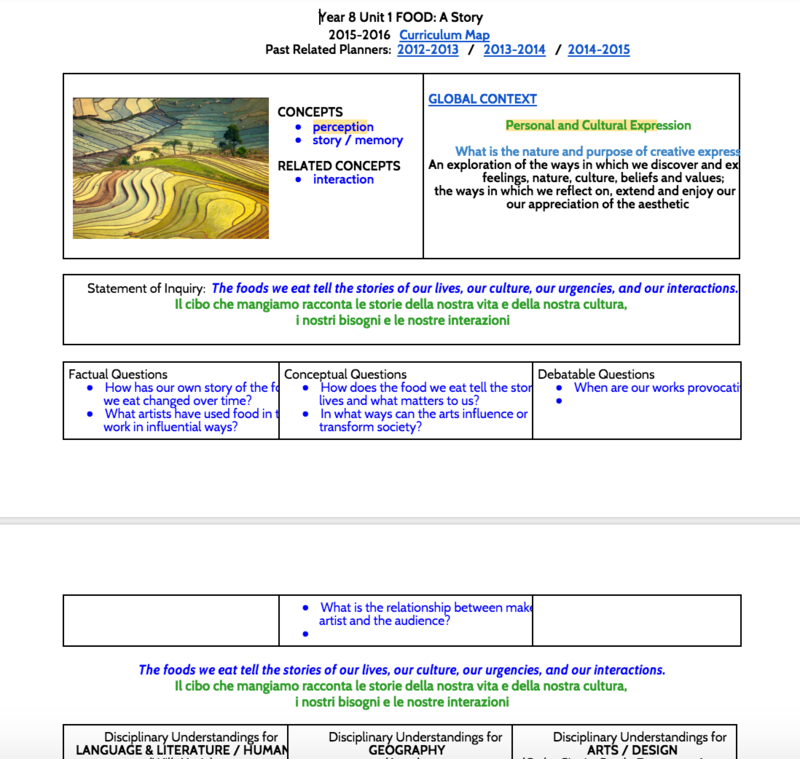 Developed elementary and middle school curriculum in collaboration with teachers. 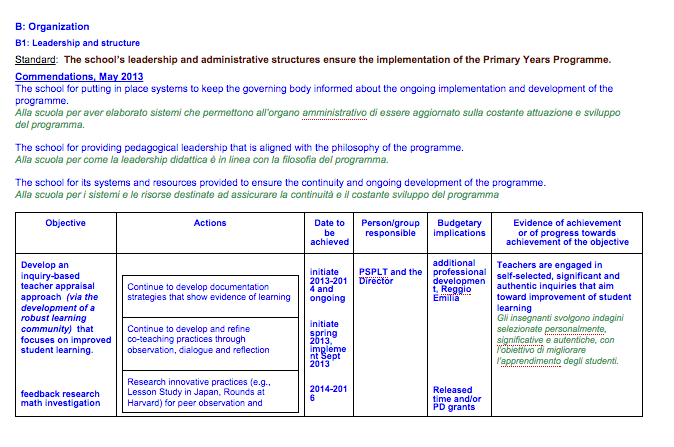 Aligned curriculum across the school. Provided professional development workshops for faculty. Led the school through the process to achieve International Baccalaureate authorization as a Primary Years Program in May 2010. Led teacher teams in curriculum development, team functioning, action plan tasks from September 2001. Taught grades three, four, and five. Primary Years Program Coordinator: guided teaching and learning, developed curriculum, procured resources, provided professional development. Middle Years Program: “Homo Faber” Coordinator, Art/Design Teacher for years 6, 7, and 10. Participated in Diploma Program development. Gifted Program Coordinator and Teacher, curriculum development across all disciplines and year levels, grades one through eight (nine years). Visual Arts Teacher, curriculum development and teaching, middle school (three years). Classroom Teacher, grades three and four (five years). Educator for Amanda Hebeler School, the campus laboratory school for preschool through grade three. The school offered an Early Childhood teacher preparation program, served as a research site for graduate students and professors, and provided for parent education and participation. Taught in a grade one model classroom. Participated in ongoing research projects with professors in psychology and education programs. Taught university courses in child development, integrated curriculum design, literacy, thinking skills, writing, and mathematics. Provided professional development, including organization of a conference for Washington State early childhood educators. 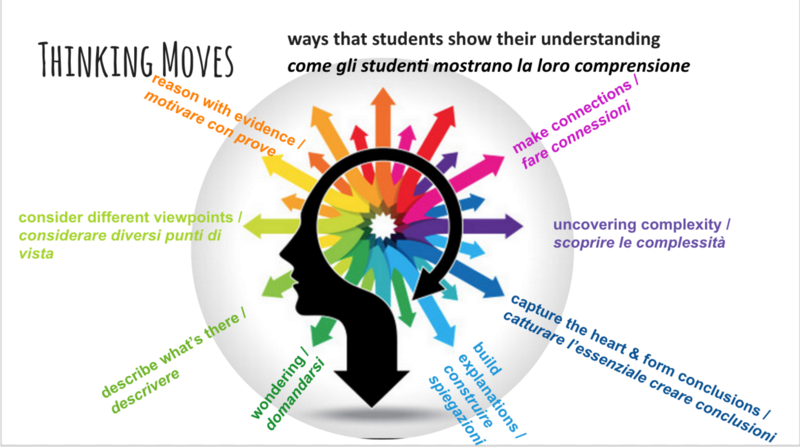 Participate in developing initiatives for student and educator curriculum collaborations with educators from other schools (Ridley College in Canada, and the International Schools of Como, Turin, Bologna, and Brescia) on various projects, from September 2013. IB Workshop Participant: Pedagogical Leadership, Concept-Based Learning, Teachers as Researchers, Interdisciplinary Teaching and Learning, Exhibition, Assessment, Mathematics, Action, Inquiry. North American Study Group Participant, Loris Malaguzzi International Center, "Atelier and Languages of Materials" on learning through the arts, Reggio Emilia, Italy, April 2009.
International Study Group Participant, Loris Malaguzzi International Center, "Documentation, Action of Listening," Reggio Emilia, Italy, November 2008. Project AERO (American Education Reaches Out) Academy for Academic Leaders, Washington, D.C., June 2007. ECIS (European Council of International Schools), Understanding by Design, Nice, France, November 2006. Making Learning Visible Institute, Harvard and Reggio Emilia Schools, research and documentation practices, Summer 2005. Project Zero Summer Institute participant, 2005-2007. 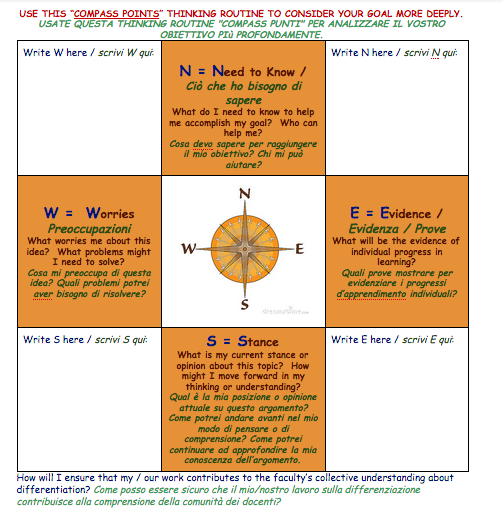 The following examples show my work in developing a multi-faceted approach to assessment. Document and monitor progress of learning goals. Develop assessment protocols and materials with input from faculty. Make learning visible to students, parents, teachers, educational leaders, and the school community at large. Observe learning in classrooms, provide written feedback, and follow-up dialogue in an ongoing cycle. I evaluate and lead development of the disciplinary and cross-disciplinary curricula.Over several years, this has included disciplinary emphases on language, science, the arts, and differentiation practices across the school. I lead curriculum review and development for each discipline in the primary and middle school programs. 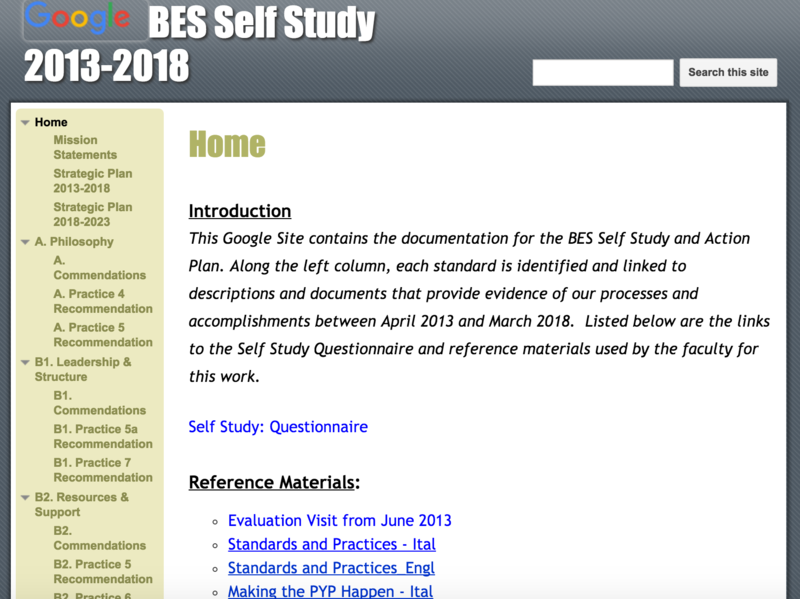 This includes research on learning, revision and implementation of written objectives, assessment and analysis of student learning, modeling teaching strategies, co-teaching and analyzing lessons, providing input in teacher planning sessions, organizing and providing professional development, and locating resources. Additionally, I lead the development and evaluation of the cross-disciplinary units of study. 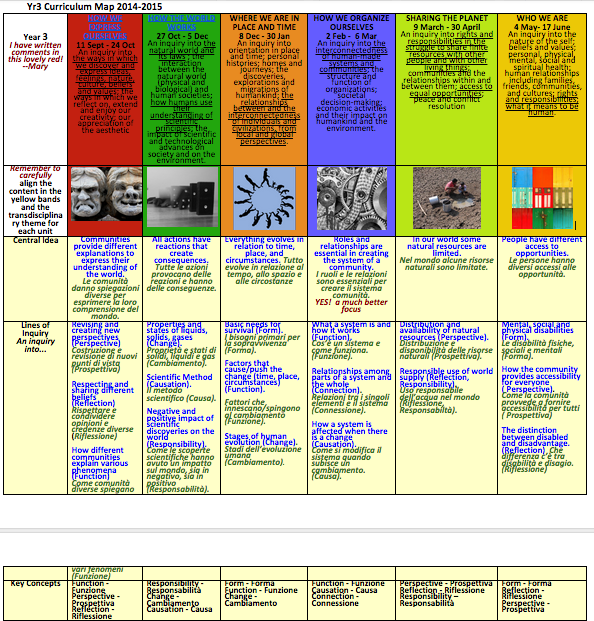 For specific examples of curriculum units click on the images below. 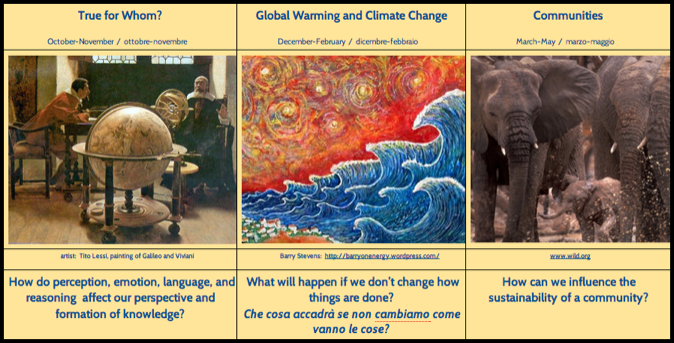 These examples show how I guide the design and implementation of a curriculum steeped in global issues across grade levels and content areas. In developing units, I ensure that students have opportunities to be creative, collaborative, and critical thinkers. I provide ideas, strategies, and resources. I develop and monitor initiatives, such as technology and other specialist integration opportunities. Targeted, effective professional development is essential to successful change in the school curriculum. To that end, I plan professional development that involves teacher choice, independent and shared work, feedback, and focus on school goals. I participate in teachers' planning meetings, which are an essential component of professional development. I plan and lead professional learning days, teacher workshops, and faculty meetings. To support teachers' development of practices, I create and promote sites that give teachers ongoing access to ideas, resources, and approaches. 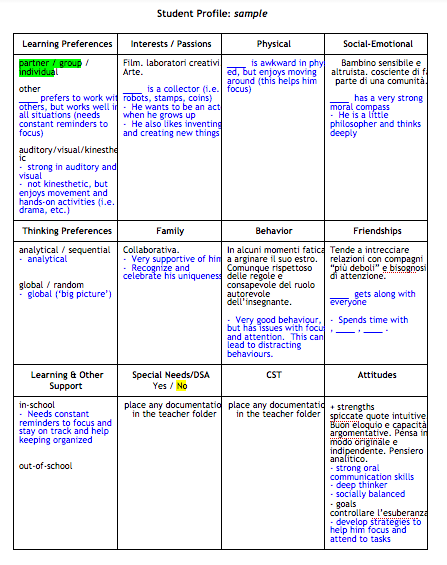 I evaluate, procure, and organize learning resources for classroom use. I created a Google site for new teachers to help them engage with the curriculum prior to their arrival at the school, and I co-facilitate ongoing induction workshops on curriculum over the year. Curriculum development is integral to strategic plans. I guide the process of developing and implementing strategic plans for the primary and middle school and regularly refer to these throughout the year as aims for our work. 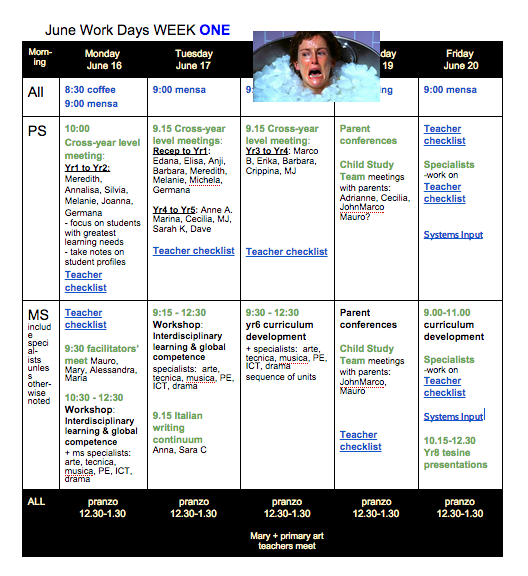 I organize, lead and document school evaluation and program revision, including a June review of the program and September school-wide program articulation and planning. I am contributing to the design of a new Learning Commons (AKA library / media center!). I contribute to parent education through various modes such as "Coffee and Curriculum" presentations, back-to-school curriculum presentations, school newsletter articles, Open Day presentations, Museums of Learning, and various learning celebrations. I have a particularly strong interest in having kids using their hands and learning in environments that inspire them to "make." I have worked closely with the LEGO coordinator to develop curriculum for physics, construction, creativity, and storytelling, and with the visual art, drama and music specialists to incorporate their disciplines into classroom learning. We have integrated principles of design thinking to develop models of inventions and are currently working with science curriculum around the concepts of consequence. I work with classroom teachers to integrate STEM learning into their lessons and to develop teacher confidence, as so often I find that elementary teachers are unsure of themselves in this realm given the pace at which new technology develops and the real or perceived expectation that they incorporate the latest thing. 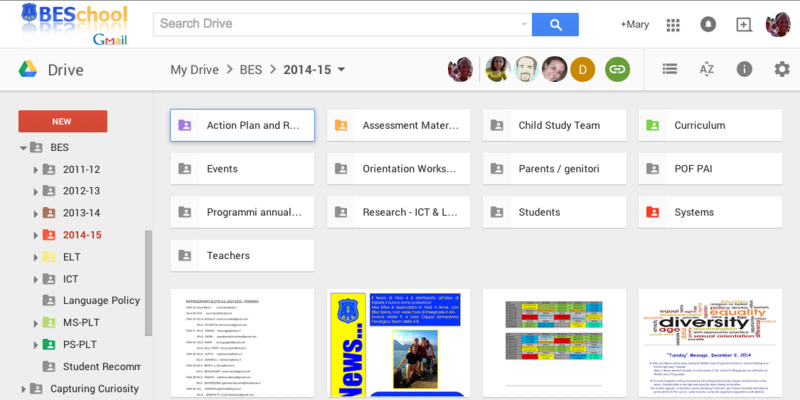 I have developed or organized sites such as the BES Google Drive, Netvibes and a Ning network for the curation, communication, and creation of work and am regularly problem solving to find better systems. Currently I am learning to develop the systems within ManageBac and provide ongoing teacher workshops for implementation. I provide support for student and teachers to use technology as a tool for thinking, organization, and expression. I have promoted the "Hour of Code" for students to learn coding as a language and a tool of logic, and participated alongside the students. I provide opportunities for students and teachers to collaborate with students and educators from other schools on various projects. I have presented various workshops at professional conferences, including several on documentation and teacher reflection. 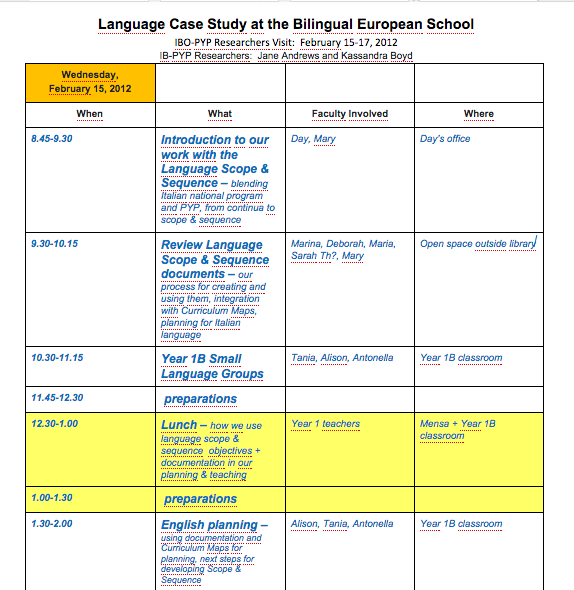 In the interest of further developing our language curriculum, I proposed a language case study with the IBO, which was completed in the spring of 2014. Director of Studies at Washington International School, Washington, D.C. I am bilingual in English and Italian and am consistently improving my skills of communication in Italian. I am a lover of learning and using technology, despite the fits I can throw over its non-cooperation at times! In addition to the initiatives already described in this CV, I created this Curriculum Vitae using technology new to me. I am involved in developing a 1:1 iPad program, the use of digital and media literacies across the school, and ManageBac for programming and evaluating learning. I have begun to learn coding, and use a range of programs and applications. Students are my best teachers! A working artist for several decades as a painter, papermaker, book artist, and printmaker. I am a distance runner and cyclist, a Pilates enthusiast, and love to hike.